I've decided to embark on collecting Sandy Koufax memorabilia up to 1980. As a kid growing up he was one my all-time favorite left-handed pitchers. I have all of his Topps issued cards. This is becoming a costly project if you know what I mean. I would prefer to trade or buy on the cheap naturally. I have plenty of cards for trade. So, what I'm looking for are all Exhibits, pins, postcards, team issue photos, coins, stamps, APBA, or basically all odd-ball stuff of Sandy. If you have anything I might be interested in let me know and I'll see what I can come up with trade/money-wise. 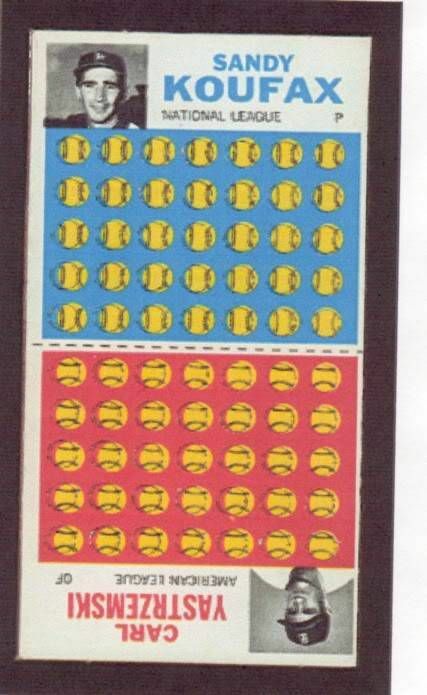 Here's a true oddball Koufax postcard I would offer for sale. 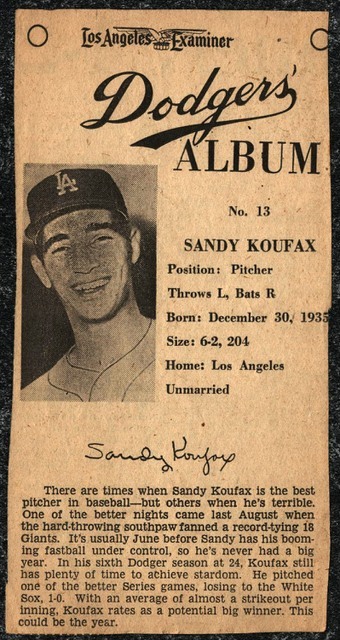 It's a C.1960's Souvenir Shop Team Issued card of Sandy Koufax with a factory misprint. Let me know if you're interested. If you want a very, very tough one, try to find the 1962 Post Canadian Cereal Koufax 7 ounce Grape Nuts Flakes version, with "walks" spelled correctly, rather than "wzlks" (what's a "wzlk"?). You most likely will have a very long but inevitably rewarding search should you find one. My very first vintage Koufax was quite the oddball. It was a 1961 Topps mini that I picked up for $2 (!) at my very first card show around 1980 in L.A. Very exciting for a ten year old kid! A few years later I learned someone had simply cut the border off the card and it wasn't a mini at all! I'd suggest you expand your collection up to 1981. There is a cool TCMA card of Koufax as coach for the AAA Albuquerque Dukes that can be had pretty cheaply. Sounds like a fun endeavor! This thread needs more pictures (not for sale). Last edited by ALR-bishop; 10-02-2018 at 09:43 PM. I have a fairly substantial collection of scored programs, including 222 of the 397 regular season games that Koufax appeared in. This is the July 24, 1955 game versus the Braves where Koufax made his 5th career appearance, all with no decision. Hank Aaron also hit his 35th career HR during this game.